There are two major types of intercalated cell in the collecting duct of the nephron – the alpha and beta intercalated cells. We are probably most familiar with the alpha intercalated cells in terms of acid-base handling by the kidney. They have a luminal H+ATPase enzyme and a basolateral anion exchanger. This polarity allows them to pump H+ into the lumen, facilitating acid excretion, which is equivalent to reabsorption of bicarbonate. The beta-intercalated cells essentially have a reversed polarity – they have a protein called pendrin in their luminal membrane. This protein is a chloride-bicarbonate exchanger, facilitating chloride entry to cells in exchange for bicarbonate excretion. As mentioned in previous posts, mutations in pendrin can cause Pendred syndrome – characterized by sensorineural deafness, hypothyroidism and goitre. It appears that pendrin is critical for bicarbonate excretion during a metabolic alkalosis, being up-regulated during this process and down-regulated by potassium depletion (an effect that could serve as a maintenance factor in a metabolic alkalosis). Pendrin also appears to play an improtant role in chloride reabsorption in the distal tubule, with increased distal chloride delivery being associated with decreased expression of pendrin and vice-versa. Furthermore, pendrin deficient mice appear to be somewhat resistant to NaCl induced hypertension. An interesting case report highlighted the development of a profound metabolic alkalosis in a child with Pendred syndrome, after being treated with a thiazide diuretic. Inhibition of the NaCl exchanger in the distal tubule by the thiazide would have lead to increased luminal chloride. Presumably whatever small residual amount of functioning pendrin was completely shut off by the presence of high luminal chloride. This would have limited bicarbonate excretion, facilitating development of the alkalosis. As previously discussed on RFN, the urea Kt/V is a measure of dialysis dose that is related to patient outcome. 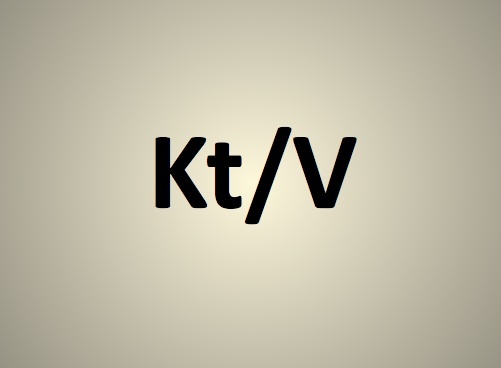 There are several different Kt/Vs encountered in the dialysis literature. A nice way to think about each one is in the context of the major trials in which they were used. The National Cooperative Dialysis Study (NCDS) published in 1981 examined four different 3x week dialysis prescription targets in 151 patients. The original paper did not use Kt/V. Instead, the prescription targets were high vs low time averaged BUN and long vs short dialysis treatment times. The time averaged BUN and dialysis times achieved were approximately 90 mg/dl vs 50 mg/dl and 4.5 hours vs 3.25 hours in the high vs low and long vs short groups respectively. Protein intake was not randomized and was meant to be between 0.8 and 1.4 g/kg though some patients fell below this range. The study showed that patients in the high BUN groups were hospitalized and withdrawn from the study protocol at statistically significant higher rates. Time was not a statistically significant variable for either of these outcomes though the p value for increased risk of hospitalization in the short time group was 0.06. The original NCDS paper did not sort out whether people in the each of the BUN groups were there because of their dialysis dose or because of their protein intake. A subsequent reanalysis in KI by Gotch and Sargent in 1985 separated these variables out using the single pool Kt/V (for dose) and normalized protein catabolic rates (for protein intake). As seen below they showed that poor outcomes were associated with a spKt/V of less than 1.0 in 3x per week dialysis. Cutting back your salt intake is an effective way to reduce systolic and diastolic blood pressure and decrease your risk of dying from cardiovascular disease. The current guidelines suggest that we should reduce our dietary sodium intake to 2.4g daily and there are moves afoot to reduce this goal even further. This is what we tell our patients and the evidence is unequivocal. Isn't it? Well... no. Multiple studies have shown that cutting salt intake reduces blood pressure. Putting patients on a DASH diet leads to lower blood pressure and two recent cochrane reviews of salt restriction in diabetics and non-diabetics found a significant effect on blood pressure which was especially marked in those with pre-existing hypertension. However, all of these studies were short-term and any effect on cardiovascular morbidity was extrapolated from the effect on the blood pressure. In a similar vein, Matt previously posted about a study published in the NEJM last year which found enormous potential financial benefits that would be derived from a population-wide reduction in salt intake. However, again, this was entirely based on the assumption that the reduction in blood pressure achieved by decreasing salt intake would translate directly into an equivalent reduction in cardiovascular morbidity. In contrast, a study of the NHANES II data published in 2006 suggested an inverse relationship between salt intake and overall mortality. This study was criticized because salt intake was measured through diet recall, which is notoriously inaccurate. That said, this can be said of many of the intervention trials relating to salt intake as most do not use the gold-standard of 24 hour sodium excretion. A paper was recently published in Diabetes Care that examined the relationship between dietary salt intake, as measured by 24 hour excretion, and mortality in diabetics over 10 years. 638 patients were included and over the study period, there were 175 deaths, 75% from cardiovascular disease. After adjusting for baseline risk factors, there was a 28% reduction in mortality for every 100mmol increase in sodium excretion. Why would less salt be bad for diabetics? There are a number of theories. A low-salt diet can lead to an increase in the activation of RAAS and this is postulated to be more problematic in diabetics, given the undoubted benefits of RAAS blockade in these patients. However, diuretics have a similar effect on renin and aldosterone levels and yet are associated with a reduction on mortality. Salt reduction has also been associated with increased LDL and insulin resistance in normal individuals. It has to be said that this was not an intervention trial. Baseline blood pressure was the same in all 3 groups and it is impossible to say what the effect of salt reduction might be in the individual groups. 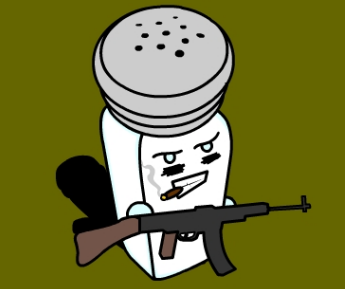 It is well known that men have a higher salt intake than women, which is related to their higher caloric intake and the high salt group in this study had a disproportionate number of men. Perhaps the lower salt intake was related to poor nutrition. Maybe the patients with lower salt consumption were advised to reduce their intake because of a perceived higher cardiac risk. It is impossible to say for certain. So does this mean we can tell our patients to eat whatever they want? No, I don't think so. It is unlikely that we will ever see a large randomized trial of salt intake in the same way that we won't see a randomized trial of smoking v. not smoking. We know that lowering blood pressure decreases cardiovascular risk and we know that reducing salt intake decreases blood pressure. Reassuringly, a large meta-analysis was published in the BMJ in 2009 which found that a high salt diet was associated with a relative risk of 1.23 for stroke and 1.14 for cardiovascular disease. Still, having reviewed this topic, it was surprising to me that there was such a relative paucity of evidence for an intervention that I recommend every day. I'm not going to change that recommendation based on one study, but it is good to have your assumptions challenged every once and a while. The maintenance of mean arterial pressure to prevent tissue dysoxia and conserve organ function is central to the management of the critically ill. 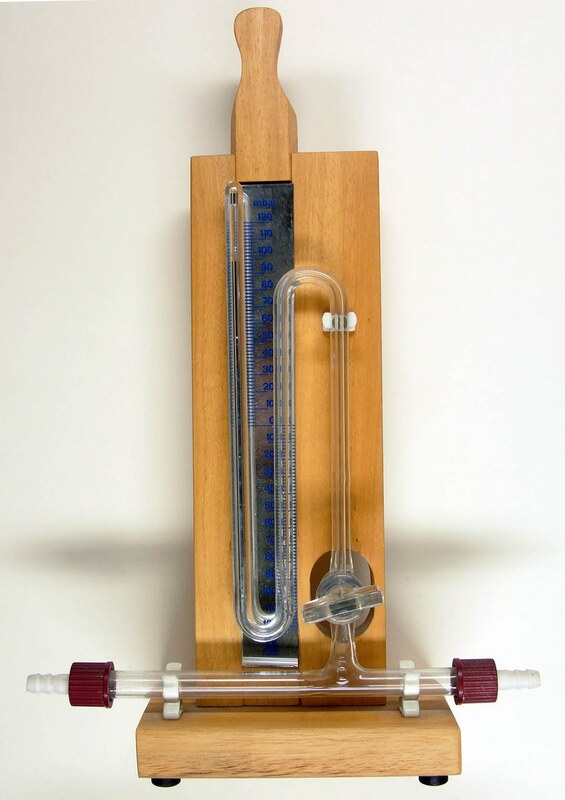 In patients with increased capillary permeability this is often achieved by administration of large volumes of IV fluids. However, resuscitation volumes of >5 litres in the first 24 hours are associated with raised intra-abdominal pressure (IAP). Although Conall & Nate have mentioned it before, a recent review of intra-abdominal hypertension (IAH) and abdominal compartment syndrome (ACS) by Mohmand & Goldfarb presents an excellent opportunity to review the topic. IAH is defined as sustained or repeated elevation of intra-abdominal pressure >12mmHg, and ACS as an IAP >20mmHg associated with new organ dysfunction. IAP is easy to measure, either through the transduction of pressure in the bladder via an indwelling urinary catheter, or using an NG tube in patients whom bladder pressure measurement is not feasible. Estimates of the prevalence of IAH and ACS suggest figures of approx. 60 and 10% respectively in non-selected ICU populations. As well as large volume fluid resuscitation, risk factors for IAH/ACS include trauma, abdominal surgery, mechanical ventilation, increased abdominal contents due to ileus or ascites, and increased capillary leak secondary to sepsis, pancreatitis, coagulopathy etc. The review of Mohmand & Goldfarb collates a number of studies showing that IAH is an independent predictor of both mortality and the development of AKI. Indeed, they report on one study, which found that IAH was the best single predictor of the development of AKI after shock. As regards management; severe ACS requires abdominal decompression by laparotomy, whereas medical strategies to reduce IAH include drainage of intra or extra-luminal contents, reduction of capillary leak and improvement of abdominal wall compliance. Given the link with volume expansion it is tempting to suggest a role for renal replacement therapy and ultrafiltration. However, good quality data is currently in short supply and probably all that can be surmised from existing studies is that aggressive continuous venovenous haemodiafiltration can be used to reduce IAP. Clearly, IAP is extremely important to bear in mind when approaching AKI in the ICU. However, whether renal replacement therapy will be able to offer improvements in outcomes requires significant further study. Just a quick piece to review the inheritance pattern of Fabry's disease, a relatively rare, but under-recognized cause of End-Stage Kidney Disease in adults. 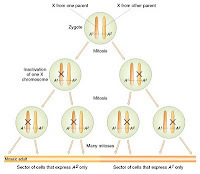 Fabry’s disease is an X-linked recessive disease, caused by a defect in the gene coding for the alpha-galactosidase enzyme on the X chromosome. 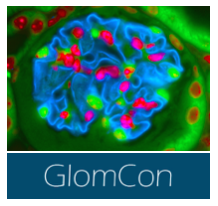 This enzyme has an important role in intracellular trafficking and metabolism of glycosphingolipids, with deficiency leading to accumulation of globotriaosylceramide in particular. A wide variety of mutations have been identified (over 300 so far) and can present with a corresponding wide range of disease severity. The spectrum of disease is possibly related to how severely a particular mutation affects the production, transport and breakdown of the enzyme. This knowledge has potential importance in treatment, as those with no enzyme activity will be much more reliant on enzyme replacement therapy than those with some residual activity. As an X-linked disease, it is generally fully expressed in males, while females have characteristically been labeled as ‘carriers’. Thankfully this term is becoming less common, as it really does an injustice to those females who have quite severe disease. How do women become affected if they have two X chromosomes, with only one of them carrying the Fabry-related mutation. Well, remember back to reproductive biology and the fact that there is random (though perhaps not as random as we think) inactivation of one X chromosome in every somatic cell in a female’s body. 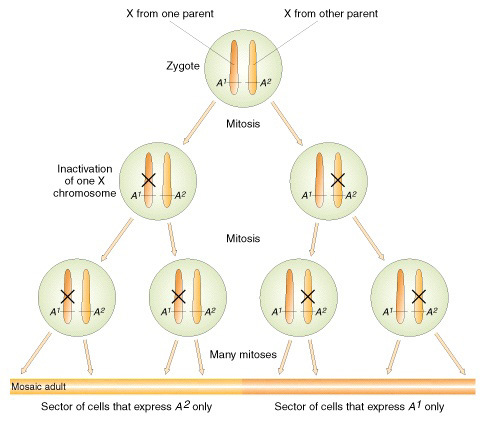 Depending on the ratio of inactive ‘normal’ X chromosomes to ‘abnormal’ X chromosomes, this will determine the net tissue expression, or lack of expression, of an abnormal alpha-galactosidase enzyme. This concept is called mosaicism – every female is truly a mosaic, with each somatic cell having either the paternal or maternal X chromosome inactivated. Consider this: what about an affected male, with a known sequenced genetic mutation, who has two daughters. We have genetic evidence that non-paternity is not an issue. Both daughters are tested for the father’s mutation by genetic sequencing, but only one carries the mutation. How can this happen – as the father only has one X chromosome, surely he must transmit this to all his daughters? The answer is interesting – during the father’s early embryonic cell division, some time after the two-cell stage, there must have been a spontaneous mutation that gave rise to the Fabry genetic defect. However, the other cell line did not undergo this mutation. Now we have two distinct cell lines that make up the developing male, similar in all things, except the presence of a new Fabry mutation. Therefore, we have essentially a male mosaic. We must presume that one of his sperm had a ‘normal’ X, which produced the unaffected daughter and the other sperm had an ‘abnormal’ X chromosome, which produced the affected daughter. 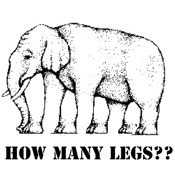 As usually happens when the renal fellows help with the medical student nephrology block, I found myself confronted last week with questions I couldn't answer. One involved the pathophysiology of posterior urethral valves (PUV), which came up in a clinical case. In case there are other fellows who, like me, tend to avoid postrenal conditions in favor of studying more glamorous parenchymal diseases, here is a short primer on PUVS. In some senses, the name PUV is a misnomer, since using the word valve implies that there exists a functional valve somewhere, which in this case is dysfunctional. 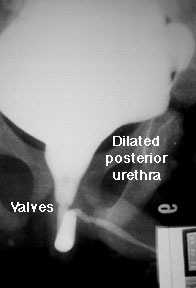 The "valve" in PUV is actually an overgrowth of urethral tissue that forms a membranous barrier to antegrade urine flow. Current thinking is that PUVs form in the embryonic period when there is abnormal integration of the mesonephric ducts into the posterior urethra. There are three main types of PUVs, of which Type 1 comprises over 95% of cases. 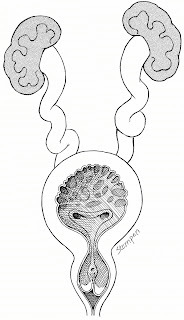 Ridges of membrane develop from the floor of the urethra, which then form membranous fins and extend anteriorly. You can see a good illustration of this on the right. In older children with a milder clinical course, voiding dysfunction can also be seen. Definitive diagnosis is by VCUG, where bladder thickening, urethral dilation and severe vesicoureteral reflux are seen. 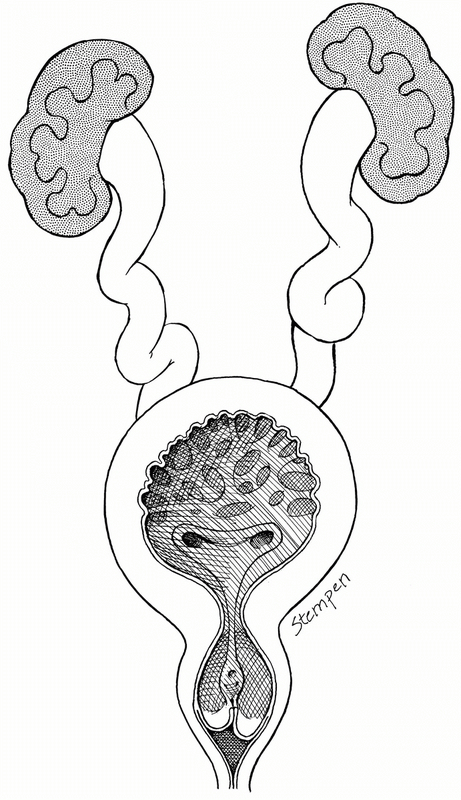 Ultrasound may show hydronephrosis and possibly increased renal echogenicity. Treatment is initially to drain the bladder, and after medical stabilization, valve ablation. Long-term followup with urology, to address issues of chronic voiding dysfunction or incontinence, may be necessary. And for any irreversible kidney damage after relief of obstruction, enter the nephrologists. 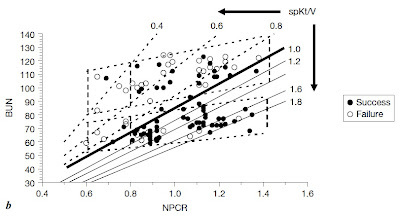 As mentioned previously by Nate, there is some evidence that lowering urine osmolarity below that of the serum can reduce the rate of growth of cysts in PCKD and thus preserve renal function. The rationale for this is that ADH stimulates cAMP production in the collecting duct and that this is required for cyst growth. Therefore, if you can reduce ADH secretion, you might be able to delay progression of the disease. One potential therapeutic option is the use of vaptans. ADH receptor-antagonists have been used in the treatment of SIADH and heart failure and theoretically, they could be of some benefit in patients with PCKD. However,these medications are not cheap and I wonder how you could ensure that the patients drink enough water so as not to become hypernatremic. A paper was published in CJASN this month that suggests a more physiological means of decreasing ADH secretion. The study included 8 patients with PCKD who had 24 hour collections to determine their mean daily excretion of osmoles as well as their urine volume and osmolarity. At the beginning of the study, the average urine Osm was 496 with a total volume of 1.5L. The aim of the study was to decrease the urine osmolarity to less than 285, thus making it hypo-osmolar and theoretically reducing ADH secretion. 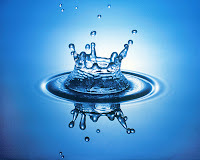 to determine the amount of excess water each subject would have to drink to reduce the urine osmolarity to 285 or below. On average, the subjects managed to increase their urine volumes to about 2.3L daily at the end of the study. The mean urine Osm decreased to 325 and 5/8 patients achieved the target of 285 or lower. Although this by no means proves that it is an effective therapy for PCKD, the paper shows that urine Osm can be safely reduced in a targeted way without the use of medications. 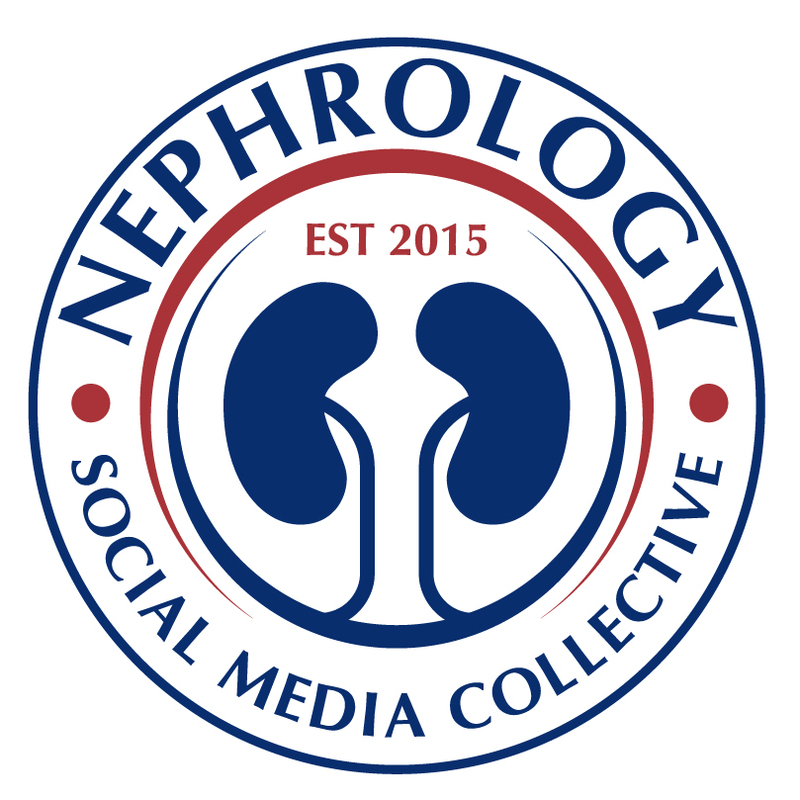 Please take a moment today to remember our dear friend and colleague Nate Hellman, founder of Renal Fellow Network, who died tragically on this day last year. Our thoughts go out to his family, especially his wife, Claire, his two children, Sophie and Max, and his parents, Patricia and Richard N. Hellman MD. It was the usual sort of day in clinic and the team was seeing a middle aged woman with stable diabetic nephropathy and subnephrotic proteinuria. Her blood pressure and blood sugars had been well controlled since the last visit and being good nephrologists her urine specimen was spun and the sediment examined. Some of these objects were sort of hexagonal like cystine crystals but the patient had never had a kidney stone, never had this finding before and was much older than one would expect for a cystinuria presentation. The maltese cross finding was odd as well. Cystine crystals don't have these. 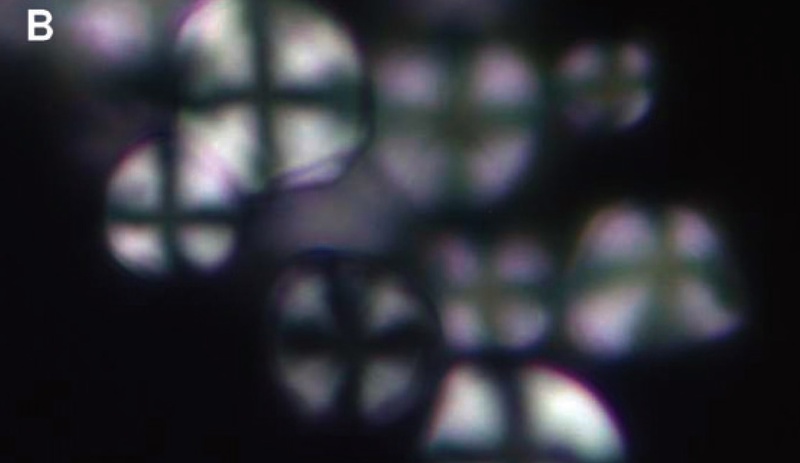 The objects didn’t really look like oval fat bodies and the crosses were not the clean symmetric looking ones typically seen in these fat droplets. The team, perplexed, split up taking the slide to the urinalysis lab to ask the techs if they knew what the heck this was, hitting pubmed and back to the patient to see if there was any funny business with the specimen. On reconvening the answer was clear: corn starch. The techs instantly said they see it all the time when their gloves contaminate a specimen. Pubmed, gave us a nice case report from NDT Plus and the patient noted having some vulvar irritation and was likely using a corn starch based baby powder which had dropped into the specimen cup. To confirm our discovery I dipped one of our powdered gloves in water and then prepared it like a regular urine specimen. Perfect match. Give it a try in clinic next time you have some housestaff or unsuspecting renal co-fellows around. GeriPal took the win by a hair. Thanks for all of the support. Follow the link to see the final results in the 2010 Clinical Sciences Category of the Seventh Annual Medical Weblog Awards from MedGadget! RFN was also a finalist in this same category last year. Case: An elderly man with dementia and type 2 DM was admitted following a protracted diarrheal illness associated with poor oral intake. Clinically, he appeared volume depleted, although his blood pressure was normal. He was hyponatremic, with a high urinary sodium and high Uosm (numbers below). The primary team had given him a lot of saline (~6L over 48 hours), which aggravated his hyponatremia, but he continued to appear volume depleted. Urine sodium remained high (65-80), as did his urine output. Despite this Addisonian-type picture, the cort-stim test was normal; renin and aldo were pending. We were called 3 days into the admission, and decided to stop his lisinopril and continue with normal saline. The results were pretty dramatic, as you can see from the graph below. He immediately became sodium avid (Una fell to less than10 meq/L) and had a water diuresis, correcting his plasma sodium to 132 meq/L over the next few days. It seems to me that lisinopril was preventing a normal physiological recovery from volume depletion i.e. mineralocorticoid production. Once the ACE was stopped, he became salt-avid under the influence of aldosterone, allowing him to correct the volume depletion and switch off the physiological stimulus to ADH production (hence the water diuresis). This was not SIADH - his ADH axis was functioning normally, as evidenced by his ability to produce dilute urine and correct his plasma Na once the ACE was stopped. 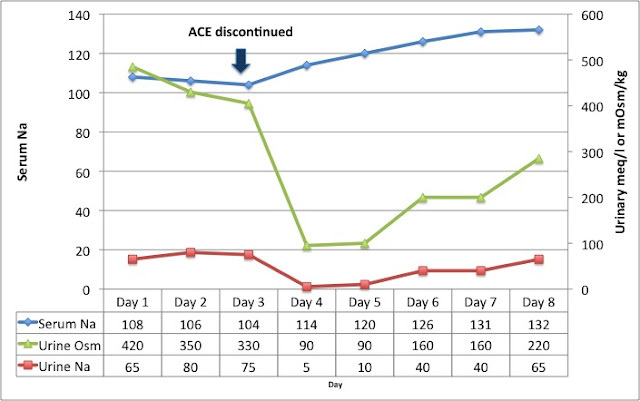 The other 2 cases of ACE-associated hyponatremia I have seen have been remarkably similar to this, where severe volume depletion developed in a patient on chronic ACEi therapy. As such, in my limited experience, the presentation differs from other types of drug-induced hyponatremia, where the sodium falls shortly after the introduction of a new agent, say an SSRI or a thiazide. This insidious mode of presentation may explain why ACE-induced hyponatremia may not be on most people’s radar. Another reason for this may be that ACE-inhibitors can also paradoxically help correct hyponatremia in CHF patients, by improving cardiac output. I’m very interested to hear if anyone else has seen a similar case, as this is a controversial topic (as I’m sure the comment bar will attest!). No time like the present for a quick review of urine electrolytes. Is there any such thing as a ‘normal’ urine sodium? Not really – like all great answers in medicine, ‘it depends’. In general, in patients who are euvolaemic, the urine sodium excretion will directly correlate with the degree of dietary sodium ingestion. In the setting of effective volume depletion, neurohormonal activation results in stimulation of a number of compensatory mechanisms (RAAS, non-osmotic ADH release, baroreceptor activation, to name a few). 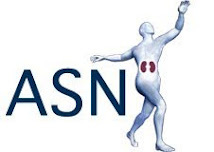 These systems are charged with the task of preserving blood pressure and perfusion to vital organs – sodium retention by the kidney is one of the major players in achieving this. Therefore, a low spot urine sodium (e.g. less than 20 mmol/L) is often viewed as being consistent with a sodium avid state, be that appropriate (e.g. shock) or not (e.g. decompensated heart failure). In certain situations the urine sodium cannot be interpreted this way. The major condition I’m thinking of is metabolic alkalosis. In this setting, the filtered bicarbonate load increases and overwhelms the tubular reabsorptive capacity, resulting in bicarbonaturia and urine pH over 6.5. In order to maintain a degree of electroneutrality, a corresponding cation must travel along with it. Sodium fulfils this requirement, thereby making the urine sodium concentration necessarily high and not reflective of the patient’s volume status, as long as bicarbonaturia persists. In this setting, the urine chloride is a better measurement of volume status, with a low urine chloride (in metabolic alkalosis) more suggestive of a hypovolaemic state. Furthermore, hypochloraemia contributes to the maintenance of a metabolic alkalosis, giving another reason for the kidney to try to hold onto as much chloride as possible. See Viresh’s blog and Ernest’s blog for more discussion on urine sodium and metabolic alkalosis. The issue of whether a marked elevation in the BUN when compared with the creatinine might represent gastrointestinal bleeding was nicely covered previously on RFN. One of our attendings recently had our group of first year fellows review the issue using a quantitative approach that highlighting the relevant physiology. Consider a 72kg male in steady state eating 90grams of protein per day with a creatinine clearance of 120ml/min and a Urea clearance of 60ml/min. A person in steady state must excrete what they produce (a key nephrology concept). So if our man makes 1440mg of creatinine he must excrete 1440mg of creatinine (if he fails to excrete it all his plasma creatinine concentration will rise and he has fallen out of steady state). We can additionally estimate the amount of BUN produced by remembering that urea nitrogen production is approximately 1/6th of protein intake. So our man eating 90grams of protein produces 15grams of urea nitrogen each day (90grams x 1/6 = 15grams) which in steady will be excreted. Now imagine that our man starts feeling unwell, stops eating and has a one liter bleed from a peptic ulcer into his GI tract. For arguments sake lets say this occurs with no drop GFR (the “it’s the blood not the renal function” argument). His protein intake is now the protein content of 1L of blood. 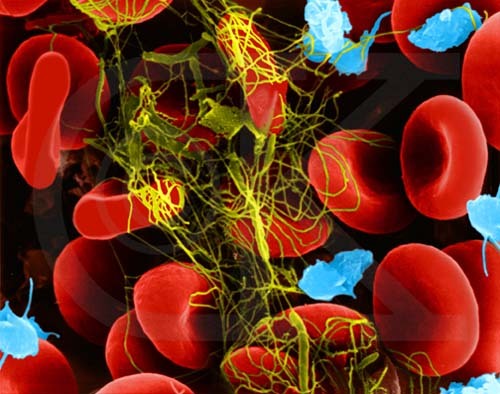 40% is cells (mostly rbcs) and 60% is plasma. The major proteins in the cellular and plasma parts respectively are hemoglobin and albumin (there's a bit more protein around from globulins and so on but this will give us a rough estimate). Notice that in the above scenario the BUN drops a bit as the protein intake has decreased. What if we kept our man eating the same diet and had him bleed at the same time while holding kidney function stable? If you almost double the protein intake you almost double the BUN (from 17 to 33 mg/dl). Now let’s try the stopped eating, 1 liter bleed scenario along with a 50% drop in GFR due to hypotension. Remember that in the volume depleted state the fractional excretion on urea is typically less than 35% and for arguments sake we’ll make it 20% in our man. As compared with no renal dysfunction we now get an BUN/Cr ratio of 23 as compared to 18. How about we run scenario with continued eating, 1 liter bleed and now with 50% drop in GFR due to hypotension with the associated drop in urea clearance. Pretty impressive, huh? With a bit of kidney dysfunction added into increased urea production we’ve now got a BUN/Cr ratio of 98 vs 40. The integration of these four things yields the BUN and serum creatinine values and the subsequent ratio between the two. As noted by Ernest, the dog paper he reviewed and the math above the most impressive BUN/Cr ratio elevations are generated by a combination of increased urea nitrogen production and decreased urea clearance. The ratio is further accentuated by the proportionally greater drop in urea clearance vs creatinine clearance seen in volume depletion. A talk recently about the HIM study at MGH (Hypogonadism In Men, Clin trial NCT00114114) prompted me to wonder about testosterone from the renal perspective. Testosterone is important for several aspects of male health, including fertility, bone density, fat and muscle mass, and sexual function. Men with prostate cancer who are chemically or surgically castrated lose bone mass, lean body mass, have an increase in fat and a loss of libido and erectile function. However, the effects of testosterone at levels between what is considered normal (~500 ng/mL) and very low ( under 100 ng/mL in chemically castrated men) are still unclear and the subject of the HIM study. Men on dialysis have a lot of the same changes reported with low testosterone levels: loss of lean muscle, loss of fertility, loss of libido and sexual function. Consistent with this, in a recent study of dialysis patients, testosterone levels in 47% of men were below 300 ng/mL (=hypogonadism); previous studies had reported that up to 2/3rds of men on dialysis have hypogonadism by this definition. Increased time on dialysis/ higher clearance apparently has no effect on testosterone levels. Part of the low testosterone comes from disruption of the normal pituitary pulsatile secretion of gonadotropin releasing hormone (GnRH) in renal failure, which is not restored with dialysis. Hypogonadism has been associated with anemia, and one of the goals of this study was to see if daily testosterone gel application will reduce the need for rhEPO in a male dialysis cohort (it did not). 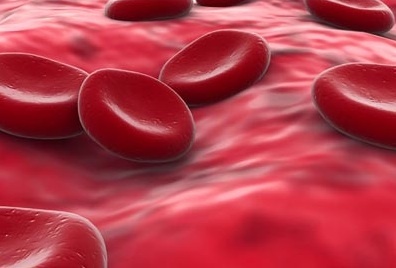 Interestingly, the article discussed that prior to rhEPO, one of the available therapies for anemia in dialysis patients were IM injections of androgens. Unfortunately, topical application of testosterone (100mg daily for 6 months) in this dialysis cohort of 66 randomized men also failed to improve lean muscle mass, bone density, sexual function or mood (as assessed by questionnaire), although the rise in serum testosterone with therapy was modest at best. Interest in improving or affecting testosterone levels in the dialysis population was recently increased after this prospective study linked low serum testosterone (in this case defined as levels under 233 ng/mL) to increased cardiovascular mortality. Here, a cohort of 126 male HD patients was followed for an average of a little over 3 years. 52% of the men had a testosterone deficiency (here defined as less than 288 ng/mL, similar with prior studies), and only ~20% had testosterone levels in the normal range. The authors then divided the group in those that had a testosterone level below the 33rd percentile (below 233 ng/mL) vs the rest. The group with the lowest levels seemed overall slightly sicker (lower albumin, more inflammatory markers, higher epo dose, more baseline CVD). Over the observation period, ~50% of the cohort died, with the majorty of deaths from cardiovascular causes. Low testosterone levels (below the 33rd percentile) seemed predictive of mortality, even after adjustment for a history of CVD, although the significance was lost after adjustment for serum creatinine levels, perhaps reflecting a common etiology. While these results are interesting, and even if a direct causal link is proven between low testosterone and CV mortality in the dialysis population, the difficulties of testosterone supplementation highlighted in the prior study give me pause. A 50-year-old woman with ESRD secondary to PKD underwent a living related-kidney transplant one-month prior. At clinic visit, she was complaining of severe throbbing pain in her hands and feet. The pain was worse on weight bearing and exertion. Physical exam was unremarkable with no joint erythema, edema or tenderness. Her creatinine was 0.8 mg/dL and metabolic parameters were remarkable for mild hypercalcemia, nl phosphate levels, mildly increased Alk Phos and PTH of 70 pg/mL. This presentation led to this brief review of potential causes of bone pain in the transplant population. One of the most worrisome bone complications in transplant patients is avascular necrosis. Its incidence is about 5.5% and it usually presents with hip or groin pain exacerbated by weight bearing. Diagnosis requires an MRI and more than 60% of patients that develop AVN will need a joint replacement. The bilateral nature of the pain and the involvement of feet and hands make AVN an unlikely diagnosis on this case. Kidney transplant recipients are also at increased risk of fractures. To give you an idea, the overall fracture risk after renal transplantation is 360-380% higher than in healthy individuals and is 30% higher during the first 3 years after transplantation than in patients on dialysis. Interestingly, in one survey of 600 patients, the most common site of fracture was the foot and different than postmenopausal women, bone mineral density is not a good predictor for the risk fracture. This has to do with the inability of BMD to evaluate the quality of the bone (architecture, turnover, composition and mineralization), only measuring the density of the bone. The patient’s pain was too diffuse to be related to a fracture. Osteomalacia caused by severe vitamin D deficiency, severe hyperparathyroidism or rapid osteopenia from high-dose corticosteroid therapy could trigger some bone pain, nonetheless her vitamin D level was normal, PTH was not very high and she had only received a short course of steroids and was steroid-free at this point. Finally, the condition of immunosuppression-related bone marrow edema syndrome came up (also known as posttransplant bone marrow edema syndrome and calcineurin inhibitor pain syndrome). This syndrome typically presents with symmetrical pain in knees or feet associated with mildly elevated alkaline phosphatase and normal ESR/CRP. The pathophysiology is not clearly understood but it seems to be related to intra-osseous vasoconstriction. CNIs have been raised as possible culprits. A MRI imaging can usually confirm the diagnosis, showing bone marrow and periarticular soft-tissue edema and absence of avascular necrosis. Despite the possibility of severe symptoms, this condition usually regresses spontaneously, being most prevalent on the first three months after transplant. Our patient was transitioned to sirolimus without improvement. After reduction of immunossuppression, her symptoms gradually improved in the following 3 months, with associated resolution of edema on MRI. In summary, bone pain is a common complication after transplantation and in defined cases, a MRI is required for further diagnosis, specifically to exclude avascular necrosis and possibly confirm bone marrow edema if early after transplant. Figure: MRI showing bone marrow edema. As you would have likely guessed by looking at the picture to the left we often tend to believe what we see without giving much thought. This is frequently true in the evaluation and management of patients with primary aldosteronism (PA) where the diagnostic tests are frequently misinterpreted and findings on imaging studies such as CT and MRI of the adrenal glands often guide therapeutic decisions. Since the initial discovery of aldosterone producing adenoma by Dr. Jerome W. Conn in 1955, PA has emerged as the most common cause of secondary hypertension and accounts for up to 10-15% of all cases of hypertension in the general population (read this article). This notable rise in the prevalence of PA has been due to the widespread use of aldosterone renin ratio (ARR) as a screening test for patients with suspected PA, and less reliance on the presence of hypokalemia (present in less than 40% patients) as a prerequisite for the diagnosis of PA. It is therefore important to remember that normokalemic hypertension is the most common presentation of PA and that the prevalence of PA increases with severity of hypertension. Although ARR is a good screening test, cut off values are variably reported in the literature, but generally speaking, a ARR of greater than 20-40 in the presence of morning (8am-10am) plasma aldosterone concentration greater than 15ng/dL and plasma renin activity ~0.5 ng/mL/h is acceptable and testing for this does not require a washout of antihypertensive medications (except aldosterone antagonists) despite the popular belief, and is practically impossible. A positive ARR therefore, should always be followed with the suppression tests. Among the several tests that are available, oral or IV salt loading and fludrocortsone suppression test are more commonly used and are fairly comparable with moderate sensitivity and high specificity (~90%). Details about how these tests are performed can be read here. Once the diagnosis of PA is confirmed, differentiating between the subtypes, particularly solitary adenoma vs. unilateral or bilateral adrenal hyperplasia is crucial as definitive therapies differ. This is best done by adrenal vein sampling (AVS), which although invasive and operator dependant, is the gold standard test to differentiate the subtypes. Diagnosis of APA is made when the aldosterone to cortisol ratio (A/C) from one adrenal is at least 4 times the ratio from the other adrenal gland (lateralization ratio). However, instead of AVS, CT scan or MRI of the adrenal glands is more commonly used to differentiate subtypes of PA. CT scan of the adrenal glands is important in identifying young individuals (less than 40 years) with adrenal adenoma (≥ 1cm) or in identifying highly differentiated adrenal masses (greater than 3 cm). Beyond that, the utility of CT scan of adrenal glands to correctly identify the subtype of PA is limited (sensitivity ~77% and specificity ~75%) and the findings can often be misleading. In a large systematic review published in Annals, CT scan was concordant with AVS in only 60% of the cases for the diagnosis of PA. Reliance on CT scan instead of AVS to differentiate the subtypes would have led to inappropriate adrenelectomy in ~15% of the patients and inappropriate exclusion for unilateral adrenelectomy in 19% patients. In 5%, wrong adrenal gland would have been removed. A study of 185 patients with adrenal incidentalomas in whom only 5% were found to have solitary adenomas further supports the argument that findings on the imaging studies should be interpreted with caution. Finally, it’s important to remember that the benefits of adrenelectomy and mineralcorticoid antagonists in correctly diagnosed patients with solitary adenoma vs. unilateral or bilateral adrenal hyperplasia respectively, extend beyond just the resolution of hypokalemia and improvement in blood pressure. Recent studies have shown a decrease in cardiovascular mortality and prevention of late renal complications such as proteinuria and chronic kidney disease. As part of the regular hemodialysis prescription, we as providers have to prescribe the type of membrane we want used for the procedure. This decision is mostly based on what membranes our dialysis unit chooses to buy – though the majority are using synthetic polymer based membranes currently. The very first dialysis membrane was made from cuprophane, later followed by the development of cellulose-based membranes. Both of these membranes contain many hydroxyl groups, which can intensely activate complement pathways. Newer synthetic polymer based membranes, such as polyacrylonitrile and polysulfone, are less likely to lead to complement activation. It is the degree of complement activation that determines how ‘biocompatible’ a membrane is. Furthermore, complement activation can lead to activation of the coagulation cascade with subsequent thrombosis, an obvious problem at the blood-membrane interface. I came across an interesting case report of a chronic dialysis patient initiation, which was notable for the development of acute thrombocytopaenia. His mean pre- and post-dialysis platelet counts were 117 ± 22 × 10-3/μL and 57 ± 27 × 10-3/μL respectively, whilst dialyzing on a particular polysulfone membrane. His post-dialysis D-dimer level was 3,748 ng/mL, felt to be consistent with activation of the coagulation system. 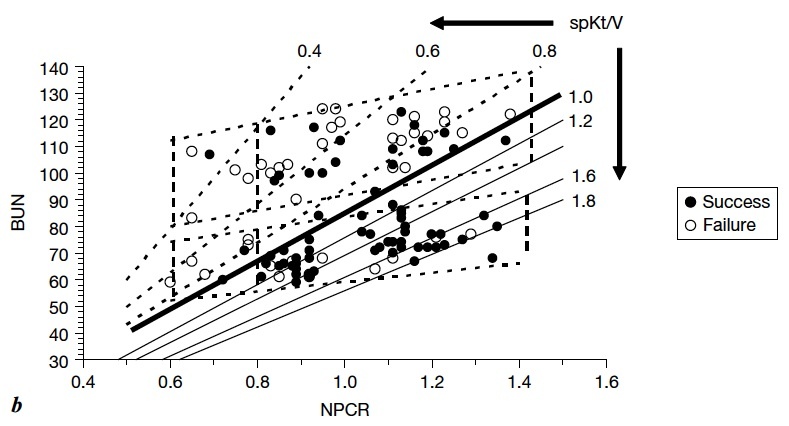 His complement levels measured post-dialysis were not low - C3 and C4 were 139 and 46 mg/mL respectively. However, we did not have pre-dialysis levels to compare them to. Heparin was withheld, but with no resolution of his low platelet count - Haematology couldn’t find a good reason for it either. The dialysis membrane was suspected, particularly in light of the elevated D-dimer, and so it was changed to an alternative polysulfone membrane, with a slightly different substructure composition. 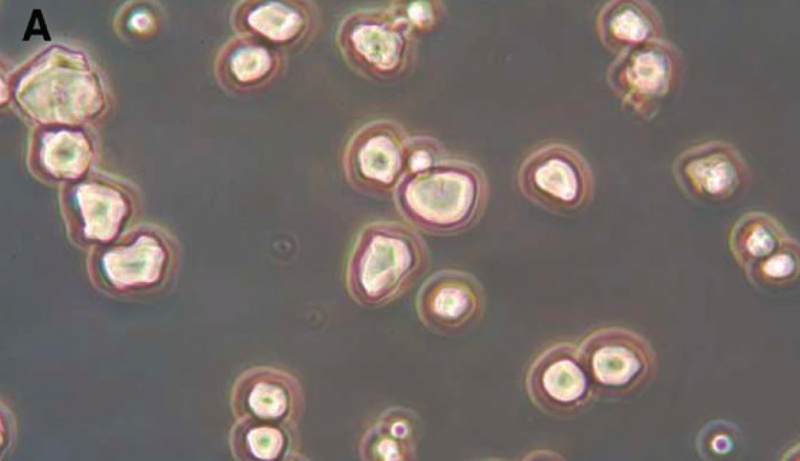 This resulted in resolution of the platelet count (157 pre and 145 × 10-3/μL post dialysis) and lowering of the post-dialysis D-dimer level (906 ng/mL). Activation of the alternate complement pathway has been reported to lead to neutrophil aggregation and stimulation. This, in turn, can predispose to platelet aggregation and activation of the clotting cascade, causing further platelet consumption. Different membrane composition can lead to differing degrees of complement activation and coagulation cascade activation. The development of new cytopaenias in newly initiating dialysis patients should raise the possibility of a membrane-induced reaction. Pre and post measurement of complement and D-dimers may help make the diagnosis. The membrane should be changed and counts followed for resolution.